Emphasis in the design and operation of most of today's new Navy aircraft is on multimission capability. One exception, by designation and intended role, might seem to be the Boeing E-6A. Fleet Air Reconnaissance Squadrons (VQs) 3 and 4 operate E-6As in the same manner as their EC-130s - as TACAMO (take charge and move out) communications platforms serving as command links to the fleet ballistic missile submarine force. The E-6 is the airborne portion of the TACAMO Communications System. It provides survivable communication links between the National Command Authority (NCA) and Strategic Forces. The E-6 is a derivative of the commercial Boeing 707 aircraft. Its a long range, air refuelable aircraft equipped with four CFM-56-2A-2 high bypass ratio fan/jet engines with thrust reversers. The weapon system is electromagnetic pulse hardened. It has an endurance of 15+ hours without refueling and a maximum endurance of 72 hours with in-flight refueling. Mission range is over 6000 Nautical Miles (NM). It carries a crew of five officers, nine enlisted aircrewmen, and up to four trainees for TACAMO missions. For ABNCP missions it carries five naval officers, nine naval enlisted aircrewmen, and a eight person battle staff as determined by the United States Strategic Command (J36). The E-6 ABNCP modification program was established to upgrade TACAMO operational capabilities by incorporating a subset of United States Strategic Command (USSTRATCOMM's) EC-135 ABNCP equipment into the E-6 aircraft. 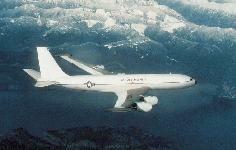 The modified aircraft have the designation changed from E-6A to E-6B. The E-6B modified an E-6A by adding battlestaff positions and other specialized equipment. 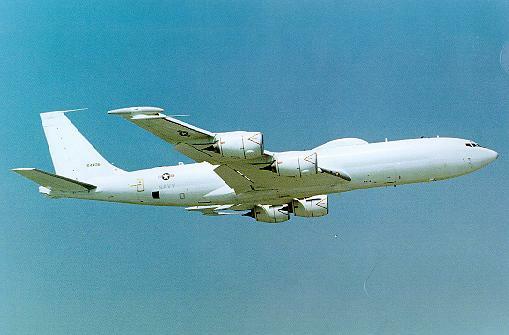 The E-6B is a dual-mission aircraft capable of fulfilling either the E-6A mission or the airborne strategic command post mission and is equipped with an airborne launch control system (ALCS). The ALCS is capable of launching US land based intercontinental ballistic missiles. 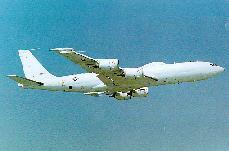 The E-6B is capable of performing both the TACAMO and ABNCP missions. This modification enables USSTRATCOM to perform current and projected TACAMO and ABNCP operational tasking using the sixteen dual mission E-6B aircraft. The E-6B provides survivable Command Control & Communications (C3) force management communications for the NCA via multiple frequency band communications. 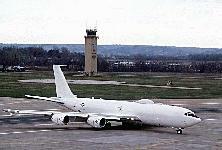 The E-6B was conceived as a replacement for the Air Force's Airborne Command Post due to the age of the EC-135 fleet. The first E-6B aircraft was accepted in December 1997 and the E-6B assumed its dual operational mission in October 1998. The E-6 fleet will be completely modified to the E-6B configuration by the year 2003. In the TACAMO role, the E-6 flies independent random operations from various deployed sites for approximately 15 day intervals. Each deployed crew will be self-supporting except for fuel and perishables. The mission requires a 24 hour commitment of resources (alert posture) in the Atlantic and Pacific regions. In the ABNCP role, as directed by USSTRATCOM, two aircraft are flown to Offutt Air Force Base (AFB) to embark the battle staff and the ALCS components and will be placed in an alert status. Maintenance of the systems is performed by the standard compliment of squadron ground and in-flight technician personnel with the exception of the ALCS which was maintained by the Air Force for eighteen months after Navy IOC. In spite of their new military designation, the E-6As, like the EC-130s, are part of a large family of transports that have been adapted to many roles. Prototypes of both designs first flew within a month of each other in the summer of 1954. 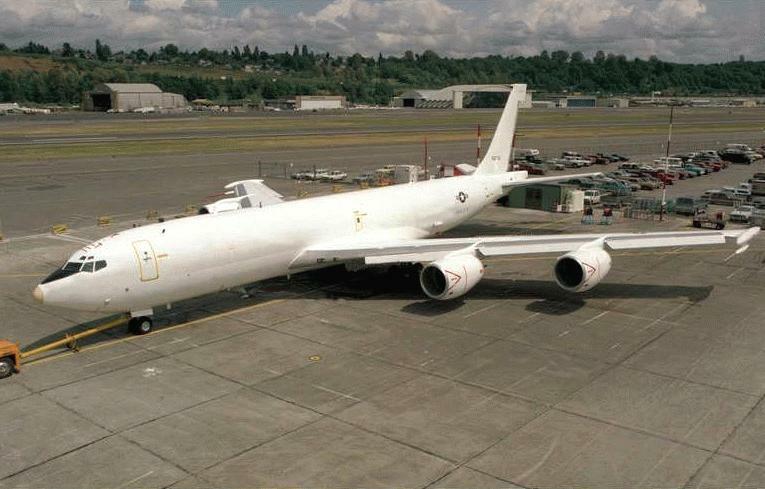 Following Boeing's prototype four-jet transport, widely publicized as the first of the 707 series, the Air Force ordered the first production models as KC-135 tanker transports. Much modified and adapted, these still serve the Air Force, and two were transferred to the Navy in the late 1970s for use in the electronics support role. Similar in appearance, but considerably redesigned, the first 707-120 airline transports rolled off Boeing's production lines in 1957. By the time these were in service, the larger 707-320 series was following, designed for long range transoceanic service. Both models soon received turbofan engines in place of their original jets. The Navy's E-6A is the final derivative of the 707-320 series to be added to the production line, joining its better known E-3A Sentry AWACS (airborne warning and control system) predecessor. The first 707-320 series to join the military took on the duties of the presidential aircraft as "Air Force One" in 1962, two joining several earlier 707-120s in the VC-137 series. Ten years later, the two prototypes for what would become the E-3 were also designated in this series. In addition to the large radome mounted on struts above the aft fuselage, similar to that on the prototypes, many detail modifications were made to the 707-320B airframe for the subsequent production E-3As. Particular attention was paid to hardening the airframe against the effect of electromagnetic radiation and nuclear blasts. Updated E-3s serve the Air Force, NATO, and other countries, and are still being produced today. With the Navy order for TACAMO versions of the 707-320B airframe, the E-6A designation was assigned for these airframes, to be built on the E-3A line. At the same time, C-18 series and E-8A designations were assigned to ex-airline 707-320Bs purchased and modified as test aircraft, both for airborne range instrumentation duties and the JSTARS (joint surveillance target attack radar) program. The former, as EC-18Bs, feature a bulbous nose radome, while the latter carry an elongated under-fuselage radome for a multimode side-looking radar. 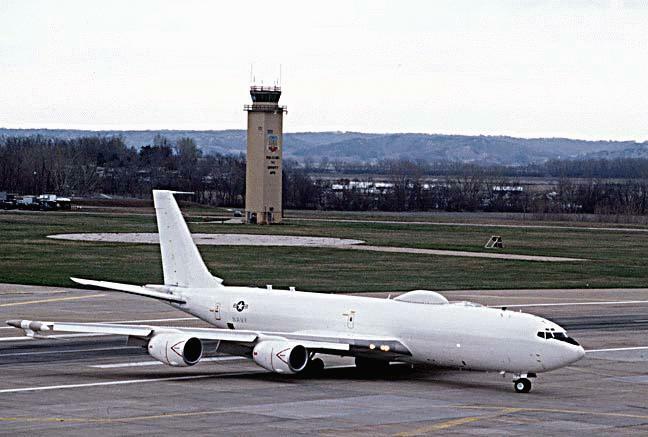 The E-6A had its beginnings in studies at the Naval Air Development Center, Warminster, Pa., looking for an expanded capability airframe for the TACAMO role. Among several turbofan-powered jet transports, the basic Boeing 707-320B was particularly attractive because of the availability of the hardened E-3A airframe in production. Higher bypass ratio, more fuel efficient GE-SNECMA CFM 56 engines were being retrofitted to various first-generation, four-jet commercial transports and would enhance the performance of a TACAMO version. Space and weight-carrying capability would accommodate the various communications systems of the EC-130 TACAMO aircraft, including the long trailing very low frequency antenna and its extension/retraction system. Based on the study results, the TACAMO replacement program got under way; the first two of a planned buy of 16 were ordered in 1984. Unusual was the concept that major components of the communications systems in squadron EC-130s would be removed and reinstalled in the E-6As as they were completed. Many features of the E-3 airframe were retained, including the in-flight refueling receptacle for the flying boom refueling system located at the top of the fuselage aft of the cockpit. A forward cargo door, as on commercial air freight transports, was installed for purposes of transporting major spare components to remote sites. Provisions for the two trailing wire antennas, one extending from under the mid-fuselage and the other from the tail cone, are among the obvious changes. Enlarged wing tip pods for special electronic equipment are also fitted. Not obvious are the structural changes required to carry the heavy communications systems in the aft fuselage and the increased level of electromagnetic pulse and nuclear blast hardening over that already incorporated in the E-3s. The first E-6A rolled out in December 1986 and made its first flight in February 1987. After initial flights at Seattle, Wash., it was ferried to the Naval Air Test Center, Patuxent River, Md., for further systems development testing. 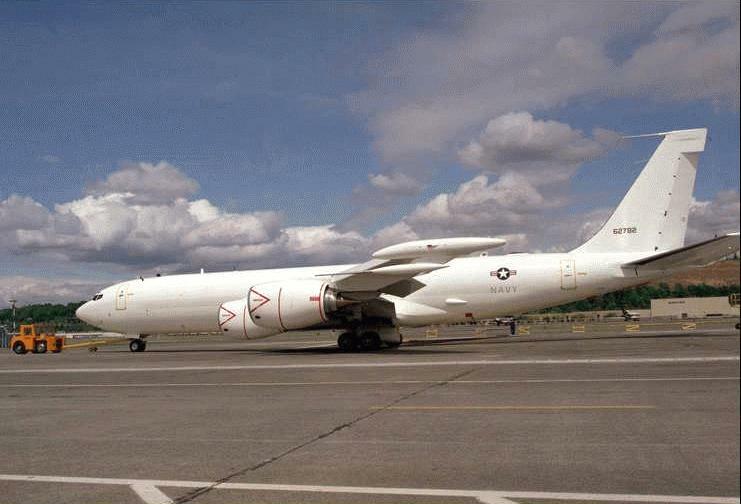 Crew training using contractor-owned commercial 707-320s began for squadron personnel with no standdown required for squadron transition - a necessity to maintain the strategic communications links. Operational test and evaluation was undertaken by VX-1. Initial deliveries to VQ-3 took place in August 1989. 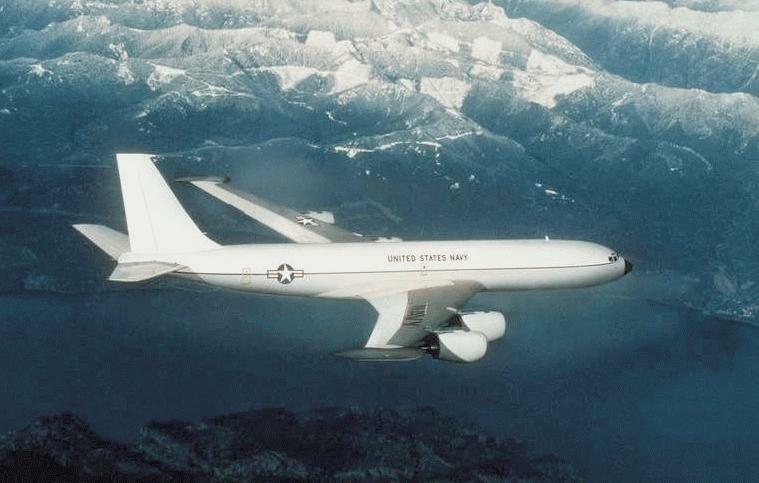 The new flight profiles and structural characteristics that the E-6A introduced to the 707-320 airframe did result in some unanticipated development challenges. Their resolution will provide the necessary survivable strategic command link to the submarine-launched leg of the strategic nuclear triad well into the future. 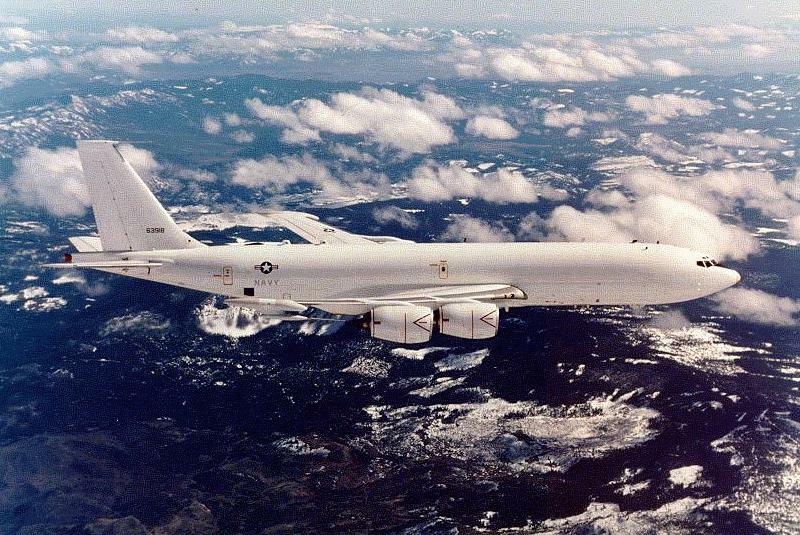 Besides the command link to the ballistic missile submarines, the E-6A TACAMO aircraft is involved in a joint mission, to provide the vital communication link from the National Command Authority (NCA) to all strategic forces. By 1998, after completion of extensive modifications, it will also provide an Airborne Command Post for United States Command in Chief for Strategic Forces (USINCSTRAT) and theater CINCs. E-6 aircrew training is accomplished by Contract Flight Crew Training System (CFCTS) and is accomplished at Tinker Air Force Base, Oklahoma City, Oklahoma. CFCTS provides program management, flight crew instruction, system operation and maintenance, and engineering services in support of the Naval Training Support Unit (NTSU). CFCTS equipment consists of two Operational Flight Trainers (OFTs), Academic Training System (ATS) and two In Flight Trainer (IFT) TC-18F aircraft. CFCTS provides ground training to pilots, navigators and flight engineers for initial qualification, refresher, instructor basic and upgrade, instrument ground school and basic flight engineer, utilizing instructor-based training, computer-based training and the OFTs. Flight training of the pilots (transition and in flight refueling) is accomplished in the TC-18F IFTs utilizing Navy instructor pilots and Navy and contractor instructor flight engineers. NTSU provides Airborne Communications Officer (ACO) and Aircrew (TACAMO Operator, Inflight Technician, Reel Operator) ground training. NTSU also provides squadron personnel Organizational ("O") level maintenance training on the E-6 aircraft and all subsystems and "O" and Intermediate ("I") level training on the Mission Avionics System (MAS) equipment. Select significant items, Failure Modes Effects Critically Analysis (FMECA), RCM analysis of failure modes, task and interval determination, maintenance level determination, task packaging. Structural tasks developed from E-3 maintenance requirement, Boeing maintenance planning data, RCM analysis of E-6 structural information. 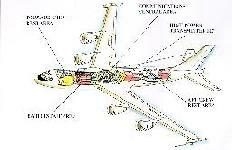 The maintenance concept is "O" to "D" for most components, with Contractor Logistic Support (CLS) from Boeing ,Seattle. There is limited "I" level support for mission equipment, and is expected to go away with the introduction of new mission avionics. Under the Integrated Maintenance Concept, as much as possible, airframe work done in field; CLS for airframe and flight deck avionics and Navy support for mission avionics. Use avail manpower for appropriate level of maintenance. Reduce costs by deleting unnecessary tasks, reducing depot inductions. Taking depot tasks to field made easier because Tinker has depot collocated with squadron. Depot level maintenance is performed in squadron spaces during routine O-level maintenance. No change of custody, reduced disassembly duplication (if an area is opened for O-level maintenance it is not re-opened by D-level), D-level artisan assists and trains O-level technician, spacing of D-level opportunities is months, not years. Up front investment is large because maintainers must anticipate parts available prior to induction. The process results in 365 days additional operating time every 5 years. Cost analysis showed that not transferring custody of aircraft to depot saves $78 million over life of program. This program gives greater visibility of the health of the airframe and, due to frequent access, provides opportunities to prevent high cost problems from developing. Subsequent to a year of in-depth analysis under Navy tasking, Raytheon E-Systems (RESY) is designing the E-6B Command Post Modification that will provide performanceimprovements and avionics enhancements for the E-6A Take Charge and Move Out (TACAMO)aircraft. The E-6B program has been established to upgrade TACAMO operationalcapabilities and cross-deck a subset of the Strategic Commands (STRATCOMs)EC-135 Airborne Command Post (ABNCP) equipment to the E-6A aircraft. The modifiedaircraft (E-6B) will be capable of performing both the TACAMO and ABNCP missions. The E-6B Command Post Modification will enable STRATCOM to perform current and projectedTACAMO and ABNCP operational tasking, using the dual mission E-6B, effectively andreliably through the twenty-first century. 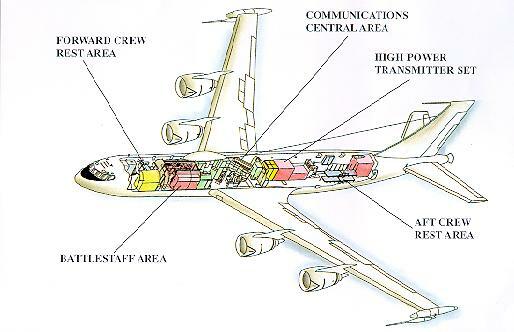 The Airborne Launch Control System (ALCS) operates through the Ultra High Frequency (UHF) Communications, Command and Control (C3) radios, enabling the E-6B to function as an Airborne Launch Control Center. The ALCS system allows determination of missile status in silos, launch, or change in missile assignments. The UHF C3 Radio Subsystem adds three UHF transceivers that support 1,000 watt full-duplex transmissions using amplitude modulation (AM) or frequency modulation. It provides: UHF frequency division multiplex (FDM) (3 full-duplex groups of 15 channels each), ALCS, conventional UHF AM line of sight (3 half-duplex channels), and/or Fleet satellite communication (SATCOM) phase shift keying (1 receive-only channel). The Digital Airborne Intercommunications Switching System (DAISS) provides automated audio distribution and equipment control/configuration among the communications equipment supporting the ABNCP mission and access to the TACAMO equipment. The Military Strategic Tactical And Relay (MILSTAR) Airborne Terminal System provides Extremely High Frequency /Super High Frequency/UHF connectivity through the survivable MILSTAR satellite system. The Mission Computer System enhances message handling and processing by providing user-friendly operations for message receipt, edit, storage, and transmit; identifying emergency action messages; and routing data among peripherals (printers, keyboards, etc.). The UHF SATCOM Receive System upgrade will replace the existing OE-242 antenna controller with a more reliable and supportable unit. The Time/Frequency Standards Distribution System replaces the existing TACAMO time standard, providing retrieval and distribution of the accurate universal coordinated time from the global positioning system. Time of day, one-pulse-per-second, and precision 5 megahertz reference signals are distributed to very low frequency (VLF) and UHF communications equipment to provide accurate reference timing. The High Power Transmit Set replaces the existing 200 kilowatt VLF High Power Amplifier and Dual Trailing Wire Assembly, providing increased capabilities (including low frequency transmission spectrum) with significant reliability and operability improvements. Three dual-redundant MIL-STD-1553B data busses accommodate future modifications to the E-6B weapon system. The E-6A communications relay mission is accomplished by trailing dual wireantennas while performing a continuous orbit maneuver. It is essential that thewires obtain as near a vertical attitude as possible for optimum very low frequencyconnectivity. Currently, there exists orbit control problems and wire/tail contactcausing bank-angle restrictions which precludes the E-6A from obtaining optimal wireverticality. Modifications to the avionics systems are required to meet the orbitoperational requirements. The E-6A Orbit Improvement Program, which corrects theE-6A deficiency, consists of the installation of autothrottles and software improvementsto the Flight Management Computer System (FMCS). The FMCS will be modified to implement the contractor developed orbit algorithm, withinterfaces to the digital autopilot. The system is designed to provide fail-safecapabilities. These modifications will fine tune bank-angle and airspeed inputsenabling the aircraft to fly an orbit which maximizes the verticality of the antennas thusensuring connectivity to the strategic forces. An E-6A autothrottle system will be developed based on existing Boeing 737 commercialequipment. The orbit improvement system does not present any threat shortfalls to the TACAMO missionenvironment. There are no major cost, schedule, or performance tradeoffs to beperformed. A feasibility study for the autothrottle program was previouslyauthorized. Based on preliminary results and background data associated withcommercial applications, the orbital improvement control system approach to correcting theE-6A deficiency was the only practical approach. Adaptation of an existingcommercial system rather than developing a new system significantly reduces costs without increasing technical risk. Production was planned for Fiscal Year (FY) 95 through FY 98 with 15 aircraft installations, plus 3 trainers, in addition to a previous engineering and manufacturing development installation for a total of 16 aircraft. The Orbit Improvement Program will enable the fleet to perform current and projectedoperational tasking effectively and reliably through the twenty first-century.